It has been a great month in my musical world, and like the weather, things seem to be heating up. April started off busy with 4 gigs in the first 4 days. An open mic, a Skylounge gig, a recording session and a Nick Strange show. On Wednesday the 1st, I went to the new Tap Room Annex in Ypsilanti to help get a new Wednesday night jazz open mic off to a good start. It is a collaboration with the Community Records Foundation, headed up by Skylounge keyboardist Jesse Morgan, and A3 Radio. All the donations collected are going to fund school music programs for schools that can not afford a music program. I agreed to play 3 of the 4 Wednesdays in April, each with its own theme. The first one was a straight up jazz open mic. The Skylounge band played host for the evening. A jazz combo from EMU started the night off with a set of standards. The Skylounge band went on second to play host to a number of musicians, and feature some of our own tunes. It was fun. People came with charts, acoustic guitars and just vocals, so the band had to be on their toes to adapt to the different settings. 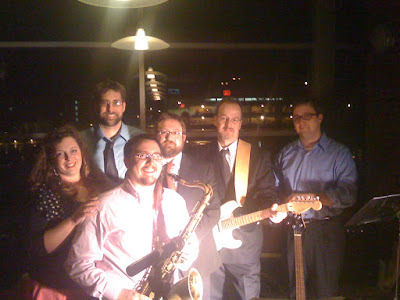 The next night was the last Skylounge band gig at EMU for the season. It has been a very interesting series of shows to play. The crowds have been very consistent and predictable, (in a good way), and the band has begun to evolve into a nice sounding ensemble. We went through some lineup and musical changes over the months to tailor ourselves to exactly what they were looking for; a band they could dance to. The next day I took my tabla and went a few blocks down from my home to Big Sky Recording studio and recorded a track for Dave Sharp's new album. I played with Dave like 3 years ago at a small kirtan gathering at Sun Moon Yoga Studio. I haven't really seen or spoken to him since. Out of the blue I got a text message from him asking if I wanted to record tabla. I said yes of coarse and he sent me the track over e-mail so I could practice with it. We finally met face to face about 10 minutes before I laid down my tabla track and then went our separate ways again. It made me think of all the musical relationships I have had like this, where we have done more music making than speaking. The personal connections seem just as solid and deep. It goes beyond a superficial 'business' transaction. You have to feel comfortable enough with someone to share a meaningful musical experience. I think this comfort can only come through the music making process. I feel fortunate to have these kinds of relationships with many musicians, and I am always ready for the next one to come along. On Saturday the 4th I kicked of the first of 4 gigs with the Nick Strange Group at Goodnite Gracies. Honestly, as I sit here I am having a bit of trouble remembering this show. I guess that can happen when you play the same venue with the same group many times. I do remember that it was with Rob Crozier on bass and he was just about to finish up his first semester at the U of M music school and he was very excited. This excitement has definitely shown in his playing and it has been a joy to play with him. The following Wednesday I got an e-mail from Jesse Morgan asking if I would come back down to the Tap Room Annex in Ypsi to play drums for the Hip-Hop open mic jam. It sounded too interesting to pass up. It actually turned out to be a very memorable night. It is part of the Wednesday night jazz series that Jesse has set up with a3radio.com and his foundation Community Records. I was surprised at the amount of talented word-slingers that were on hand. Jesse and I were the only 2 musicians and we just played deep grooves all night while the mic was passed from person to person. I had so much fun just listening and playing along. I turned out to be a very memorable experience, and I hope to be asked back again. In the last 2 weeks of April I had 6 shows in just 4 days. Once again, I could not have pulled it off without the help of my student Vinnie Russo, who has become very good at setting up my drumset just right so I can just walk in, sit down and start playing, which is just what I had to do on the 17th. I had a show with my group Sumkali at Crazy Wisdom tearoom, which is a show that normally goes from 8:30-10:30. Since I had to start at Goodnite Gracies at 10, I was forced to cut out of the CW show early. That was harder to do than I had expected. First of all, I had to make sure the rhythm was covered for the Sumkali performance, which it was very ably by Dan Piccolo. He has been playing a lot with us lately and so I had no worries that he could hold it down for the half of the show I could not be at. I had also asked Shani Thirumali to come join us for a couple of numbers. She plays the Veena, which is the older ancestor of the Sitar. It was a great start to the night and set the mood perfectly. She hasn't performed in front of people too much, so she had some nerves, but as it often happens with able musicians, after the first few notes were out of the way she did great. The hardest part of the night came when it was time for me to step out. The crowd was full, the sound was great, and the atmosphere was really nice. It was difficult to walk out of that and walk into a dark barroom not yet populated and quiet. I took a few breaths and it turned out alright, and we actually had a few people from Crazy Wisdom come down to the club and check out the second show. I was talking to them on the set break and they said that they had no idea that I also played the drumset. I love these sort of surprises! The next day Sumkali, minus Dan, Atmaram, and Shanti had a gig at the Cromaine Public Library in Heartland, MI. It was set up by Scott Brady and it was during the day, which is always nice. It was also nice to play in a very quiet setting. Indian instruments are so quiet to begin with, that any outside noise can be a big distraction. We were the first musical group that they have had at the library, so they were still working on their advertising and promotions, which is the nice way of saying there was hardly anyone there. We all still had a great time though and we got some good recordings out of it. The manager of the library loved it and said she would like to have us back once the music series is more established. The last Wednesday of the month I was back at the Tap Room Annex. This time it was the improvisation theme, so everything was improvised the whole night. There were a lot of musicians on stage this time and all I can remember is what I would describe as a wall of sound all night. Have you ever had a conversation with a loud talker? How about a non-stop talker? How about both at the same time? This is what seemed to happen on this night. Improvisation amongst musicians is a lot like a conversation amongst strangers, you really have to be aware of not only what you are saying, but what others are saying. And, as a musician playing in a group, you don't really stop the flow of sound, you have to know how to lay your sound out so others can be heard. It is a subtle art that, when it is good, is one of my favorite musical experiences. When it doesn't click though, you get a wall of sound that just pushes everything louder and crazier, and all parties seem to just man their own post as the ship sails through the high seas. O.K., so are you getting the idea of how this night went? When it was over I was tired, my ears were mad, and I just wanted to cut out as quick as I could. Luckily, some of the other members felt the same thing happen so next time we can set sail with calmer waters in mind. The final two shows of the month fell on the same evening. They were a familiar pair, Ann Arbor Kirtan and the Nick Strange group. This time, however, the Nick strange group was at the Firefly jazz club on South Main St. in Ann Arbor. They were celebrating the 6th C.D. release. What made this night tricky is that the Nick Strange group started an hour earlier than usual, so the Kirtan overlapped it by a half hour. I had to negotiate with the kirtan group to end 10 minutes early, which they agreed to with no problem, and then I had to convince Dan to start his set acoustic, which he did as well. I did not like having to be the thorn in both groups for the evening, but when scheduling live music is as tough as it is in this town, you have to take what you can get. Vinnie helped me out on the Firefly side, and a tabla student of mine, Simon Ha helped me on the kirtan side by taking my tabla home for me. I could not have pulled it off without them. So having a night like this always causes me to pause beforehand and take a few breaths. I know that I have a big night of music in front of me, so pacing is very important. It is lucky that doing kirtan lends itself to slowing down and calming the mind. I wanted to be sure to be present in the moment all night and not think about what had to be done next and I think that mindset helped keep me calm. I arrived early and was happy to have my son Charley with me. He hung around for the set up and soundcheck and then wen home early with mom. We wanted him to come to a kirtan in the shirt they bought for him before he was too big to wear it. It made me happy to have him there, and it helped to keep me calm. So usually the Kirtan ends with a 10 minute silent meditation, so what I did was sneak out as soon as I hit the last note. everyone had their eyes closed, so I heard that many people did not even see me leave. I got in my car and took the 2 minute drive down to the Firefly. I walked into the club and Dan motioned me to come on stage the moment he saw me. I was a minute into the first song before I even got a chance to look around at this place I had never been. It was a true test of my nerves. No warm-up, no time for a breath, no time to even think, I was playing. After the first song was over I was thinking to myself that the kirtan group had probably not even opened their eyes yet and already I am playing the second song of the night, which just happen to include a drum solo, AAAAAGH! It was a roller coaster ride. It made for an exciting night that I will not soon forget. I really enjoyed the club. It was a nice space and the best part was that it was a non-smoking room, which has been a rarity when playing with this group, (made up of all non-smokers). A few kirtaners came down after the kirtan was over and watched a few sets, which was nice to see. I had a really good time, although I hope I never have to pull off something like that again! So that is it for April. Thanks for reading I will write again soon.